Upon approach to this impressive Anglo-Norman castle we were astonished by the massive ruin of the rectangular gate house which is flanked by large projecting 1/2 round towers to either side of the entrance. 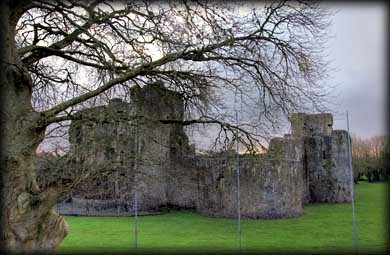 The castle is almost square in plan, with three-quarters round towers at each corner. In the centre of the E and W curtain walls there are D-shaped towers. Projecting from the southern curtain wall is a small rectangular tower, possibly used as a sallyport. All the towers are taller than the curtain wall. It is mentioned in the Four Masters as built by Richard de Burgo, the Red Earl of Ulster, in 1300. 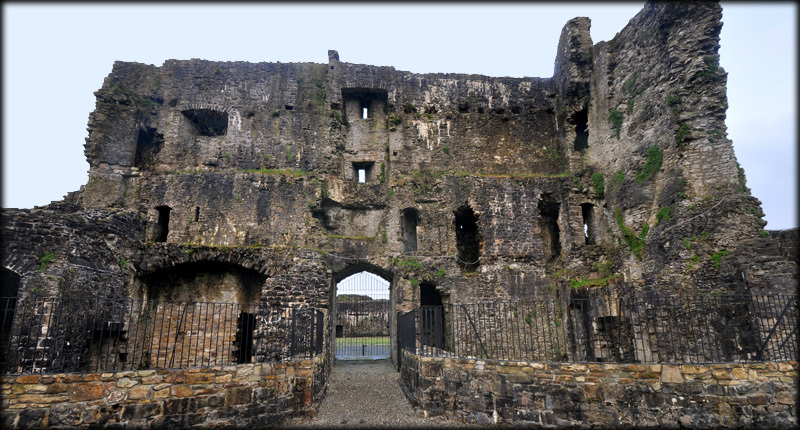 Standing as the strongest fortress in Connacht, it was believed to be captured by the O'Conors in 1317. This began an incredibly rich history of attack, fire and changing hands, before being sold to Red Hugh O'Donnell in 1498 for £400 and 300 cows. It was from here that O'Donnell marched to the disastrous battle of Kinsale. 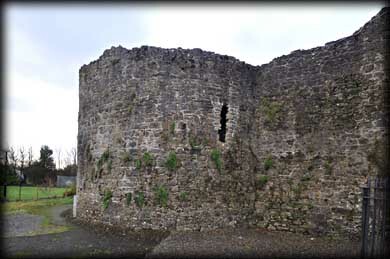 Upon defeat at Kinsale it was surrendered to Lord Mountjoy, and again began a history of attack and surrendering the castle. Finally in 1690 it became the property of Lord Granard who destroyed it's fortifications, filled the moat, and let the castle fall into ruin. 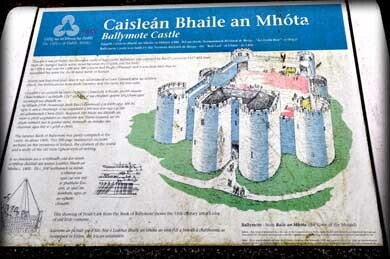 The famous Book of Ballymote was partly compiled in Ballymote Castle about 1391. This 500 page document includes sections on the invasions of Ireland, the creation of the world, and a study of Ogham writing. 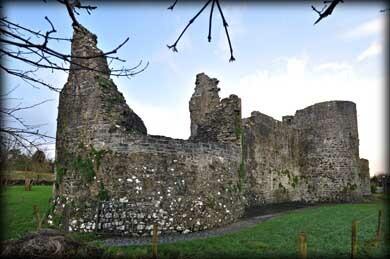 A short walk from the castle will bring you to Ballymote Abbey. Situated: Very easy. located at the west end of town beside the Railway Station. Discovery Map 25: G 6599 1550. Last visit Dec 2011.